UK: Jewish orgs. protest Marxist Corbyn’s antisemitic Labour party……. – The Tundra Tabloids……. Having let in a whole new crop of Jew haters (Muslims), the Left under the Marxist Corbyn has a problem of which constituents it’s going to cater to, with the Muslims being the most violent, chances are good that they will carry the day. 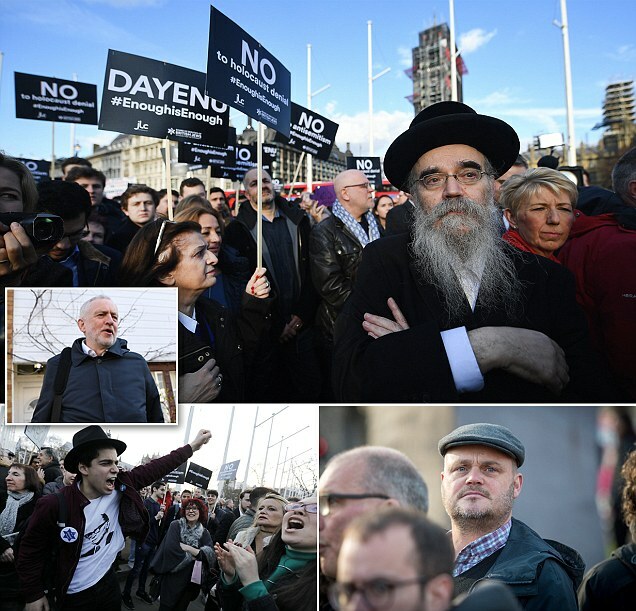 Hundreds of protesters (pictured top and bottom left) gathered outside Parliament tonight to support Jewish leaders in a strong condemnation of Labour leader Jeremy Corbyn (pictured inset). They came to warn Mr Corbyn that ‘enough was enough’ amid an anti-Semitism storm. Comedian Al Murray (pictured bottom right) was among the protesters in Parliament Square. Jonathan Goldstein, the Chairman of the Jewish Leadership Council, told the huge crowd that the Labour leader must do more to stamp out the ‘cancer’ of anti-Semitism inside his party. Mr Goldstein said there is ‘no safe space’ left for Jews inside Labour and wherever they go Jews are told ‘Rothschilds run the world, ISIS is a fake front for Israel and Zionists are the new Nazis’. Mr Corbyn tonight issued a grovelling apology for his actions and admitted the problem was bigger than ‘just a few bad apples’. He also repeated pleas to meet with Jewish leaders. Previous Post Previous Post Aussie Dave @Israellycool: To Kill a Jew, Muslim terrorists targeted victim because “she was wearing religious Jewish garb”……. Next Post Next Post INDIA is “scared” of Pakistan’s “growing economic stability” as the two nuclear-armed nations continue to trade blows along the contested border…..